The Nlaka'pamux of southwestern British Columbia were first introduced to Christianity by Anglican missionary John Booth Good. 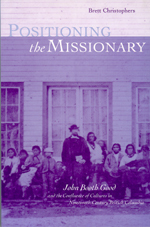 The process of interaction between the Nlaka'pamux and Good, and its effects on both parties, is the subject of Brett Christophers' Positioning the Missionary: John Booth Good and the Confluence of Cultures in Nineteenth-Century British Columbia (UBC 1998 $65). 0-7748-0654-0. Christophers studied in the Department of Geography at UBC and now lives in London, England.